This timeless and classic Miadora necklace and earrings set combine white pearls with diamonds to create an elegant and sophisticated look. Coordinate these pieces with any ensemble from business casual to everyday wear. All weights and measurements are approximate and may vary slightly from the listed information. *T.W. (total weight) is approximate. 1/10 carat T.W. may be 0.08 to 0.12 carat. Treatment code N (white pearls, white diamonds). See Treatment Guide for further information. Treatment code D (Dyeing) for main stone. See Treatment Guide for all treatment code information. Pearls evoke a sense of sophistication, style, and opulence. Use this guide to help answer your questions about these types of pearls and find the perfect option for you. 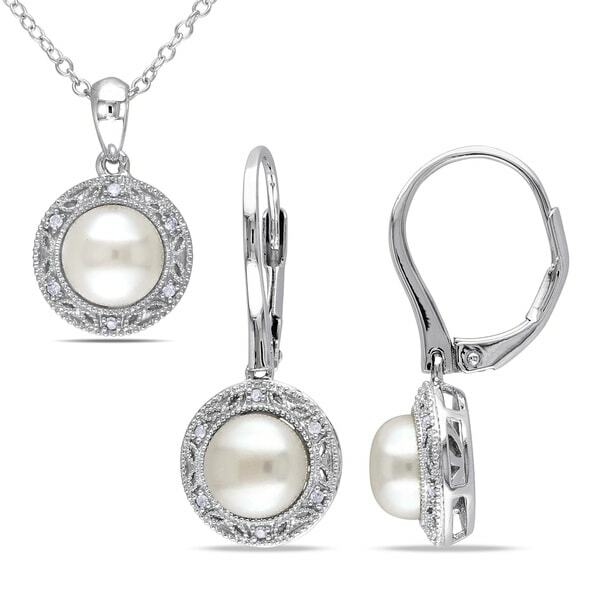 Top 5 Things to Know about Pearls from Overstock.com. Our guides provide customers with the top 5 things to know about pearls. Pearl Buying Guide from Overstock.com. Our guides provide customers with information about pearls. Choosing the right necklace length is critical for maintaining a fashionable look. Take into consideration your neck size, your height, and the neckline of your clothing for fashion-savvy choices. How to Tie a Lariat Necklace from Overstock.com. Our guides provide customers with information about how to tie a lariat necklace. Best Necklace Chains for Sensitive Skin from Overstock.com. Our guides provide customers with information about the best necklace chains for sensitive skin. How to Wear Pearl Necklaces Casually from Overstock.com. Our guides provide customers with information about how to wear pearl necklaces casually. Make time to remember the people who will help you celebrate your big day with personalized gifts for the bridesmaids and groomsmen.